James Haydon will replace Proton KR rider Kurtis Roberts for the Qatar Grand Prix on Saturday October 2. Haydon has not competed in the GP series since 1996, when he rode a 500cc two-stroke for the W.C.M team. Since then he has raced in both British and World Superbikes, including a stint with the Foggy Petronas team. 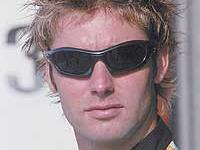 In 2004 he has ridden for Virgin Yamaha in the British Superbike championsip. It's the first GP to be held at the Losali circuit in Qatar, so track knowledge will be the same for every rider. And Haydon will be joined on the grid by another BSB regular, Yukio Kagayama, who is coincidentally replacing Kurtis' borther Kenny Roberts Jr. See the link on the right for more. Follow the fortunes of the MotoGP series with live updates next weekend on www.motorcyclenews.com. Have Your Say, here.